The caecum is an organ belonging to the digestive system. The caecum is a bag representing the first part of the colon, following the ileum and small intestine. The ileo-caecal valve regulates the entrance of the food bolus into the caecum, which then passes the foods being digested into the ascending colon. The caecum is a bag approximately 8 cm in size. 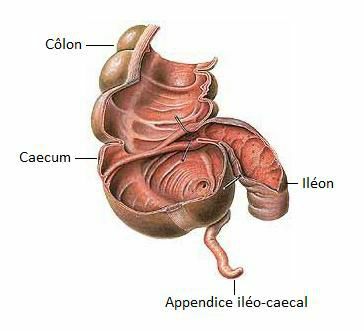 The ileo-caecal appendix is attached to it.